Making Connections to Judaism: Congregation B’nai Israel, the only Conservative synagogue in New Mexico, invites the community to the first lecture in its Fall 2013 Making Connections to Judaism Speakers’ Series. 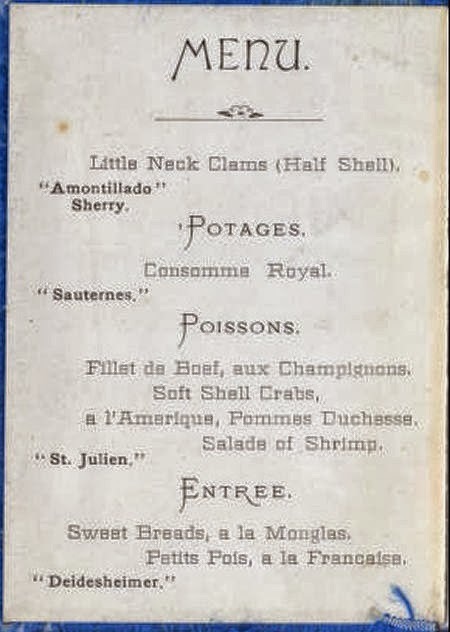 Evening lectures (7:00 – 8:00 pm), each preceded (6:30 pm) by a lite dinner. 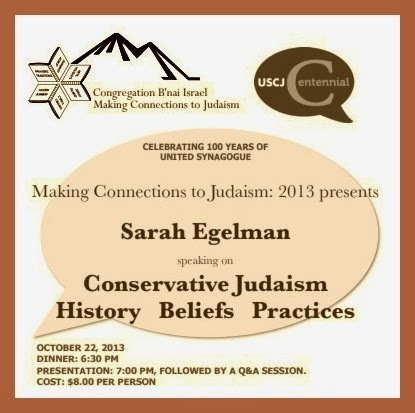 Sarah Egelman, of the Communications, Humanities, and Social Sciences Department at CNM, introduces us to the history, beliefs, and practices of Conservative Judaism in her upcoming lecture. But what does that mean? How much tradition? How much change? Is there something that Conservative Judaism stands for – more than what it stands against? The traditional and egalitarian values and practices of Conservative Judaism are concisely enumerated in Emet ve-Emunah: Statement of Principles of Conservative Judaism. The Introduction tells us that the Conservative Movement had its inception in Germany, in 1845. In 1845 a meeting of modern rabbis convened in Frankfurt. On the third day Rabbi Zechariah Frankel left the meeting in protest against a proposed resolution that declared that the Hebrew language was not “objectively necessary” for Jewish worship, but should be retained “in deference to the older generation”. When in 1857 the Jewish Theological Seminary, the first modern institution for the training of rabbis, was founded in Breslau, Frankel was appointed its Rector. Within a few years the institution became the dominant intellectual force in the religious life of central and western European Jewry and beyond. Basically, the movement which Frankel founded was a reaction against Reform on the one hand, and Orthodoxy on the other. The Breslau Seminary was the inspiration and model for similar institutions founded in Vienna, Budapest, London and Berlin, as well as overseas on the American continent. And in these United States, no discussion of the origins of Conservative Judaism would be complete without mention of The Trefa Banquet, which celebrated the first (1883) graduating class of Hebrew Union College in Cincinnati. This, of course, is only an indication. You have to read the entire 46-page pamphlet to begin to understand exactly what Conservative Judaism stands for. Three characteristics mark the ideal Conservative Jew. First, he or she is a willing Jew, whose life echoes the dictum, “Nothing human or Jewish is alien to me.” This willingness involves not only a commitment to observe the mitzvot and to advance Jewish concerns, but to refract all aspects of life through the prism of one’s own Jewishness. That person’s life pulsates with the rhythms of daily worship and Shabbat and Yom Tov. The moral imperatives of our tradition impel that individual to universal concern and deeds of social justice. The content of that person’s professional dealings and communal involvements is shaped by the values of our faith and conditioned by the observance of kashrut, of Shabbat and the holidays. That person’s home is filled with Jewish books, art, music and ritual objects. Particularly in view of the increasing instability of the modern family, the Jewish home must be sustained and guided by the ethical insights of our heritage. The second mark of the ideal Conservative Jew is that he or she is a learning Jew. One who cannot read Hebrew is denied the full exaltation of our Jewish worship and literary heritage. One who is ignorant of our classics cannot be affected by their message. One who is not acquainted with contemporary Jewish thought and events will be blind to the challenges and opportunities which lie before us. Jewish learning is a lifelong quest through which we integrate Jewish and general knowledge for the sake of personal enrichment, group creativity and world transformation. Finally, the ideal Conservative Jew is a striving Jew. No matter the level at which one starts, no matter the heights of piety and knowledge one attains, no one can perform all 613 mitzvot or acquire all Jewish knowledge. What is needed is an openness to those observances one has yet to perform and the desire to grapple with those issues and texts one has yet to confront. Complacency is the mother of stagnation and the antithesis of Conservative Judaism. This is the ideal, toward which all those who call themselves Conservative Jews (and this includes Abq Jew) must continuously and continually strive. It ain’t easy. Now if – after you attend Sarah Egelman’s lecture, of course – you’d like to learn lots more about Conservative Judaism, Abq Jew strongly recommends The Observant Life: The Wisdom of Conservative Judaism for Contemporary Jews. The Observant Life: The Wisdom of Conservative Judaism for Contemporary Jews contains a century of thoughtful inquiry into the most profound of all Jewish questions: how to suffuse life with timeless values, how to remain loyal to the covenant that binds the Jewish people and the God of Israel and how to embrace the law while retaining an abiding sense of fidelity to one s own moral path in life. Written in a multiplicity of voices inspired by a common vision, the authors of The Observant Life explain what it means in the ultimate sense to live a Jewish life, and to live it honestly, morally, and purposefully.